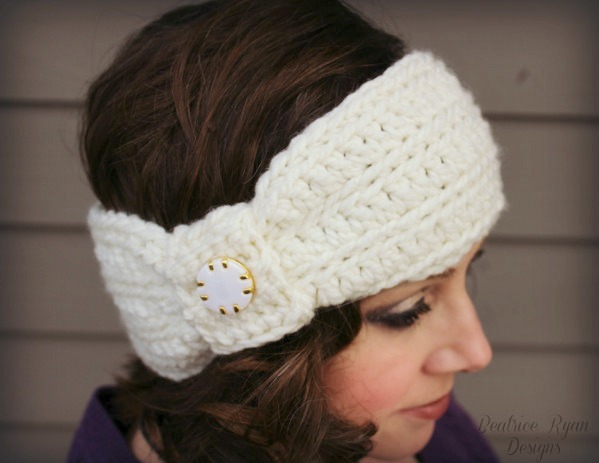 Wintertide Headband… Free Crochet Pattern!!! Wintertide headband is an easy to wear, fashion forward headband… It is a one skein project and is super fast and easy to make!! You can dress it up by adding a decorative button too!! If you love this pattern,, Please add it to your Ravelry Favorites and Queue,,, Click Here!! Ch 60, Join to the beginning to form a ring. Be very careful not to twist the chain while joining. Row 1: Ch 1, Sc in the same Ch and the next 54 Chs, Ch 5, Skip the last 5 chains of the previous row and Join to the top of the beginning Sc with Sl St. = 55 Sc and 5 Chains. Wrap the Gathering Band around the un-worked chains of the headband bringing the short ends of the band together. Whip Stitch the ends together using the tail left for sewing. Sew Decorative Button on the front of the gathering band all the way through the back of the band to secure the band in place as well as the button. Weave in any ends. Congratulations… You now have a Wintertide Headband!! Love this! Want to add it to my ravelry, but for some reason the link you provided isn’t working, and doing a search for it on Ravelry isn’t turning up anything, as well? Boo!!! ?? Aaaaand…. Never mind 😉 I tried again and this time it worked. Thank you!!! Great pattern! 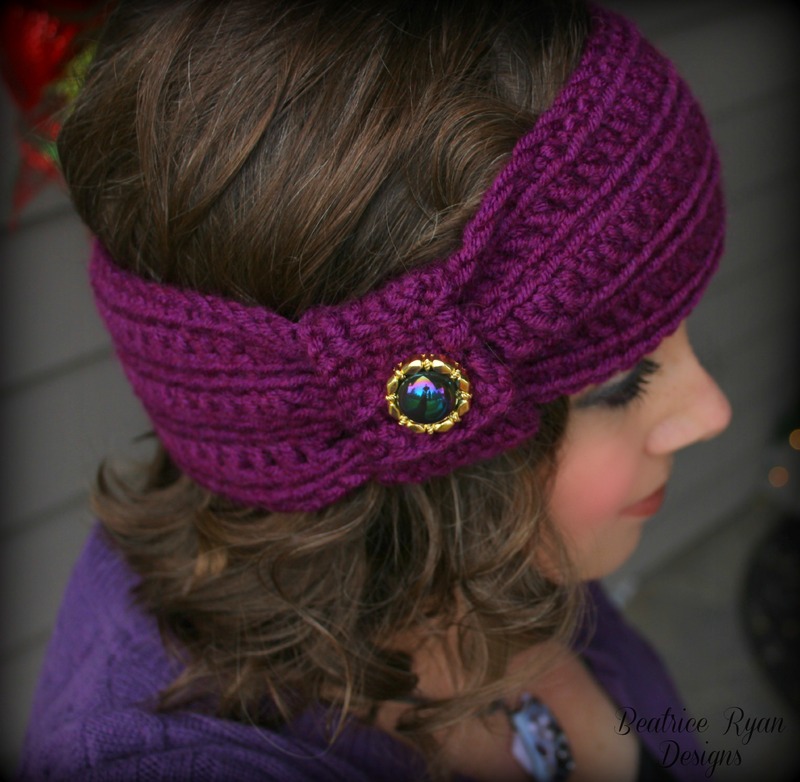 I love this headband but when I started reading the description and direction, realize it’s for crochet. I don’t crochet, but I do knit. Do you have any similar patterns for knitters? Thanks. Thank you for stopping and liking the pattern… I don’t have any knit patterns… I do knit, but am not proficient enough to writ patterns. I see your picture with 3 headbands and they all look like they’re a different size. Did you use different kind of yarn or hooks in each one? Or did you adjusted the started chain? Thanks for the wonderful free partners and also thanks in advance for your reply. They are very close to the same size… the picture is deceiving… but Yes they yarn did make some difference. I have tried 10x to not get the chain to twist when I join. Is there a trick ? I really liked the Headband. I’ve been looking for a simple one and you have provided one for me. I make two last night. So easy. Thanks. Great!! I am so happy it worked out for you!! Love it! It’s so simple and elegant! I think the little bit of “bling” that you added absolutely makes the headband. I am a beginner , so agree that there should be a video. Nice pattern. Hi…great pattern but I have a question…. 1. Why the chain 5, why not just join? It seems to make it bulky when trying to join everything together. … thanks and have a nice day…. Made perfect sense to me why you chain there. I’ve done something similar to that technique before when you want less bulk in a particular section. I love the pattern. Thank you so much for sharing. Had “error occurred” retype…..I would like to receive wintertide headband. Having trouble getting pattern. Thank you. Just head back to the Free Pattern Page and click on the pattern you would like. I just know she’s going to love this one! I believe the Hometown is super bulky… and the wool spun was just bulky… This would result in a different effect and size. I love this pattern and would like to make it for myself, but I’m not a fan of bulky yarn. How can I adjust it so that I can use worsted yarn instead? I love your patterns… Your very inspiring although I have yet to try this one! I have done almost all of your Amazing Grace collection, because I have my own Amazing Grace and she is my world! Hey there! 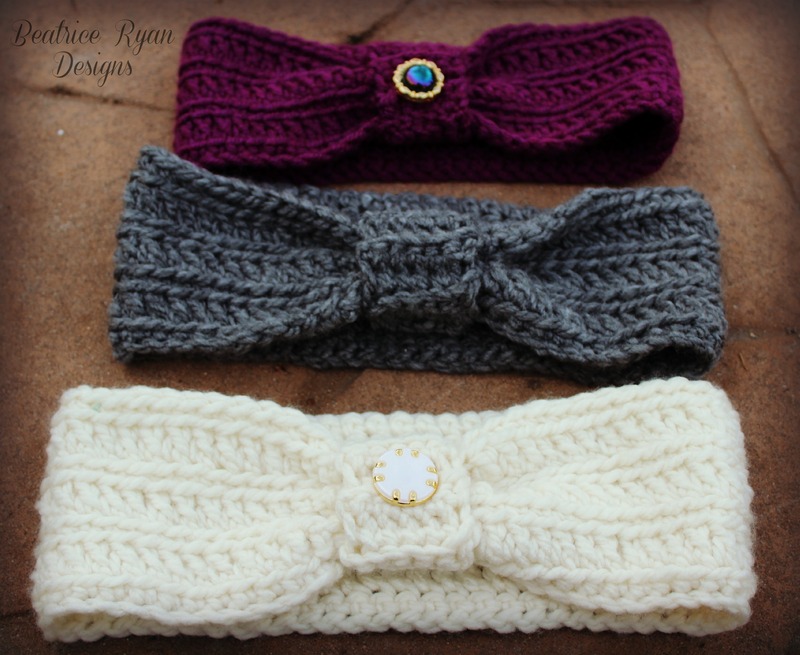 I love this pattern to pieces and just completed the headband portion of it! I’ve gotten to the decorative cover of it, but I’m confused as to how to add it to the headband?. Should I simply wrap it around the chains? or weave it through them? Again, thanks for such an adorable pattern!! I love this pattern! Thank you for creating and sharing! Can you tell me what the width should be? Great pattern! Quick question: is row 3 worked in back loops only as well? Thank you! Would this fit a toddler about 18 months old? Or maybe if I change hook size? This was my first headband. I made it as a Christmas gift. I am going to make one for myself as well, I am not a hat person. Easy pattern like it a lot. Can this pattern be downloaded as it is free? If so, where is the link?